Today’s programme started with the sermon by Abdul Wahab of Pakistan after Fazr prayer. A dowry-free mass wedding programme will be held at the venue of Ijtema, around 20km off the capital, after Zohr prayers Saturday as is traditionally done every year. The first phase of Ijtema will conclude with Akheri Munajat (final prayers) Sunday while the second phase of the congregation will be held from January 18 to 20. 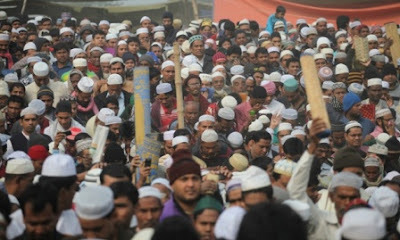 Tablig Jamaat has been organising the Biswa Ijtema, also called the World Muslims' Congregation, every year since 1946. People from 32 districts of the country and 8,000 devotees from 85 countries including Pakistan, India, Saudi Arabia, Brunei, USA and Bahrain are participating in the first phase, Tablig Jamaat sources said. Devotees from the rest of the districts will participate in the second phase of Ijtema. A multi-layer security system by 12,000 uniformed and plainclothes members of police, Rab and intelligence agencies was in place at the Ijtema ground to ward off any trouble. Thousands of volunteers are also serving the devotees round the clock. Though there are restrictions on women's participation in the religious congregation, several hundred women from different districts rented houses adjacent to the Ijtema ground to listen to the sermons. Free medical camps were set up at the northern part of the Ijtema field to provide immediate medical assistance to the ailing devotees.